Has Apple struck a "5G-Wi-Fi" deal? Some devs playing around with the beta OS X Mountain Lion 10.8.4 have come across code that hints at the future of Apple's Mac range. According to 9to5mac, this code references 802.11ac Wi-Fi - superfast Wi-Fi capable of 1.3 gigabits per second - a receiver for which is something that isn't present in the current OS X 10.8.3. Talk of Apple doing a deal with Broadcom for its 802.11ac chips began back in January, though nothing was ever confirmed. But we'll take this is a strong suggestion that a handshake did end up taking place. So what does 802.11ac give us exactly? Aside from 1.3 gbps of Wi-Fi goodness, it also gives the Wi-Fi receiver a better range too. Broadcom refers to 802.11ac as 5G Wi-Fi, with a connection speed that starts at 450Mbps - the maximum speed for Wi-Fi in most consumer gadgets. 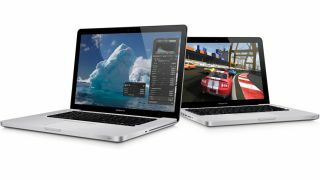 As for when we'll see it, it's anyone's guess for now - but the MacBook range is due an upgrade in the next few months. Could we see it appear then? It's looking like a distinct possibility.